Worshipers pray during Christmas eve mass service at the cathedral in Bali, Indonesia, Dec. 24, 2016. Church leaders in Indonesia have called on Christians throughout the country to pray for the victims of Saturday's tsunami that struck parts of the west coast of Java. Although many churchgoers have fled the area out of fear of more disasters, somber ceremonies were still held in some churches. Anita Sitorus presided over a service Tuesday at the Rahmat Carita Pentecostal church near Carlita, one of the hardest-hit areas. "After this incident, God let us continue to serve the people, and especially this is a chance ot serve God better," Sitoris said. The tsunami struck without warning, sweeping over popular beaches, engulfing tourist hotels and coastal settlements. Indonesian disaster management officials say the death toll from now stands at 429 people. An Indonesian soldier inspects the damage at a tsunami-ravaged village in Sumur, Dec. 25, 2018. 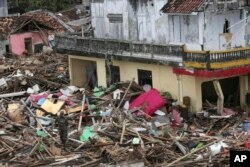 Rescue crews have turned to sniffer dogs and drones to search for any remaining survivors of the tsunami, which devastated communities in between the islands of Sumatra and Java in the Sunda Straits.Over 1,000 structures have been damaged or destroyed, including hundreds of homes. Over 1,400 people have been injured and at least 128 others remain missing. “The cause of the tsunami was due to a combination of undersea landslides after the eruption of Mount Anak Krakatoa and the tidal wave caused by the full moon," according to BMKG.However, the Indonesian Geological Agency said that they can't confirm if the tsunami was triggered by the eruption of Krakatoa, since that mountain has been erupting since last June – with even greater strength – and never caused a tsunami. The chief of the Geological Agency, Rudy Suhendar, told VOA's Indonesian service that it was still investigating what caused the tsunami in the world's most populous Muslim country. "Thank God I could save my family," he told VOA's Indonesian service. People feared by tsunami run in panic on a street in Sumur village, Indonesia, Dec. 25, 2018. The Red Cross said Banten is one of the "worst affected areas. "The aid organization, however, said it was able to dispatch "relief goods" from its Banten warehouse, including water, tarpaulins, cleaning equipment, plus family and hygiene kits. U.S. President Donald Trump tweeted about the "unthinkable devastation" caused by the tsunami. United Nations Secretary General Antonio Guterres' spokesman said the U.N. chief was "saddened by the loss of life, injuries and damages caused by the tsunami" and that the world body "stands ready to support the ongoing Government-led rescue and relief effort". On Sept. 28, a quake and tsunami that hit near the city of Palu, on the island of Sulawesi, killed more than 2,500 and displaced about 70,000. On Dec. 26, 2004, an earthquake in the Indian Ocean triggered a tsunami that killed 226,000 people in 13 countries, including more than 120,000 in Indonesia. VOA's Indonesian Service contributed to this report.